Hall-of-Famers? Eleven members of the Hall have suited up for the Hawks, four of whom (Bob Pettit, Lenny Wilkens, Cliff Hagan and Dominique Wilkins) built most or all of their respective resumes with the franchise. Dikembe Mutombo may follow. Spectacular superstars? How’s Pistol Pete and the Human Highlight Film? Memorable moments? Sadly, not many coinciding with team success, but Wilkens’ playoff duel against Bird, as well as his and Spud Webb’s performances in the Slam Dunk Contest are etched in fans’ minds. Sounds great, right? Well, almost. For all that the Hawks’ franchise has achieved in its 61-year history, for most fans in Atlanta, virtually none of the success took place a) in their city or b) in their lifetime. All the same, this is a franchise that is no stranger to immensely talented players. Wilkens spent with the first half of his Hall-of-Fame career with the St. Louis Hawks after being drafted sixth overall in 1960. 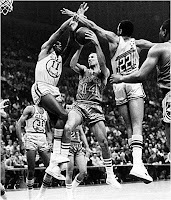 In his eight years with the Hawks (1960-1968), Wilkens was named to five All-Star teams and finished second in the 1967-68 MVP voting, behind Wilt Chamberlain. Wilkens still ranks in the top four among guards in Hawks’ history in points (2nd), rebounds (1st) and assists (4th). Beyond the statistical achievements, Wilkens’ Hawks were a postseason staple (seven playoff appearances in eight seasons) and finishing first or second in the division six times. The only time in his run that the Hawks missed the postseason was in 1961-62, when Wilkens was limited to just 20 games. 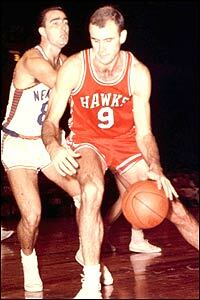 In his rookie year, Wilkens teamed with Bob Pettit to take the Hawks to their second straight NBA Finals. 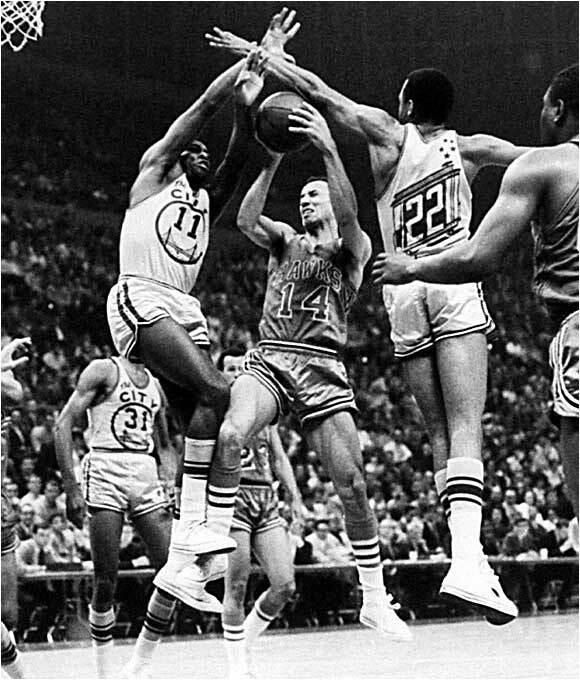 That postseason, St. Louis knocking off the Elgin Baylor-Jerry West-led Lakers, before falling to Bill Russell’s Celtics in five games. Statistically there’s a comparison to be made between Wilkens and Mookie Blaylock (14.9 ppg, 4.6 rpg, 7.3 apg, 2.5 spg in 518 games)- whose Hawks teams were actually coached by Wilkens. This was pretty close. Both put up very similar numbers with the Hawks. Both made seven postseason appearances with the Hawks, but Blaylock never played in the Finals. And despite holding an edge over Wilkens in rebounding and assists, Blaylock’s individual achievements are limited to just one All-Star team and a pair All-Defensive 1st Team selections. After an unbelievable college career, “Pistol” didn’t miss a beat in his first four NBA seasons in Atlanta. While he played on some pedestrian Hawks teams, Maravich was at his spectacular best and put up some outstanding numbers, particularly in years 3 & 4 (26- 4.4- 7 in 1972-73; 27.7- 5.3- 6.2 in 1973-74), his first All-Star seasons. While Pistol Pete put fantastic numbers and received a variety of honors throughout his collegiate and pro career, it’s tough to sum up his career, especially his early years, in a traditional “resume.” Maravich’s impact on the league was far more visceral. He was ahead of his time. A prototype that’s yet to be truly replicated. One of the most spectacular and dynamic offensive players in league history. A highlight maestro. We’ve grown a bit numb to it now, but Maravich was the first NBA star who would leave you laughing out loud in an empty room, texting your buddies. You know, if people in the early 1970s were texting. After five nice seasons with the Hawks and six more to come- assuming no one’s suckered into trading for him along the way- 2010’s highest paid free agent, Joe Johnson (yikes! ), will undoubtedly accumulate the numbers to take this spot. 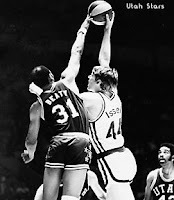 However, short of a trip to the Finals or ring, Johnson will never rival the impact of Maravich. The only other noteworthy candidate here was Steve Smith (18.6 ppg, 3.8 rpg, 3.6 apg in 339 games), and while he’s awesome on NBA TV and was one of the better SGs of the 1990s, it wasn’t very close. ‘Nique is one of the most versatile, dominant and entertaining scorers in NBA history, arguably the best dunker we’ve ever seen and deserving of a spot in NBA’s top-40 all-time. Despite never getting past the second round of the playoffs (that is a bit damning), in his 11+ seasons with the Hawks, Wilkins produced an amazing individual resume, with nine All-Star selections, an All-NBA 1st Team nod (1986), four All-NBA 2nd Team selections, five seasons of 29+ ppg and the 1986 scoring title. That he was left off of 1997’s 50 Greatest list is an embarrassment. While his incredible talent didn’t translate into team success, anyone that watched Dominique play invariably has a some unforgettable, awe-inspiring moments permanently committed to memory (how about this and this?). Unfortunately for ‘Nique, playing during the Michael Jordan era kept him from being remembered as one of the best individual players ever. 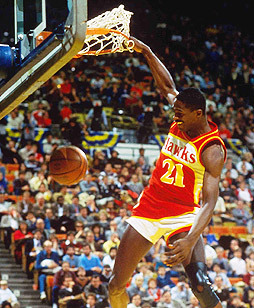 No one other than Dominique Wilkins is as synonymous with the Hawks’ franchise as Bob Pettit. And he retired almost half a century ago! Not only did Pettit lead the Hawks to four Finals trips and the franchise’s only championship in 1958, he scored 50 points in title-clinching game against Bill Russell’s Celtics- a postseason record at the time. Pettit was an All-Star in each of his 11 seasons, won four All-Star MVPs, selected to the All-NBA Team 10 times, won matching scoring titles and MVP awards in 1956 and 1959 and Pettit never averaged less than 20- 12 in a season. And while these achievements were racked up in a much pastier NBA, that’s still a pretty amazing resume. 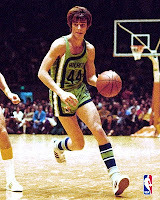 Pettit is still second in Hawks’ history in points (20,880), first in rebounds (12,849) and fifth in assists (2,369). He was the NBA’s first great power forward, and 45 years after his retirement, remains one of the best ever. No one else was really close here, although Dan Roundfield (17.6 ppg, 10.7 rpg, 1.6 bpg in 435 games) and Kevin Willis (14.1- 9.7 in 753 games) deserve to be mentioned. Did you know that four eventual Hall-of-Famers- five if Dikembe Mutombo is inducted- have played center for the Hawks? And ironically, the nod here goes to the only member of the top six not enshrined in the Hall. Before jumping to the ABA’s Utah Stars, Zelmo Beaty spent his first seven pro seasons with the Hawks- six in St. Louis, plus the franchise’s first in Atlanta. In his time with the Hawks, Beaty averaged a double-double six times and produced three 20- 10 seasons as the Hawks made the playoffs in each of his seven seasons. Although his never enjoyed ultimate team success, Beaty did average 17- 11 in 63 playoff games with the Hawks. Among centers, Beaty ranks in the top three in franchise history in games played (1st), minutes (2nd), points (1st), rebounds (2nd) and assists (3rd). In terms of per-game averages, Beaty also ranks in the top three among Hawks’ centers in scoring (2nd), rebounding (3rd) and assists (1st). In the end, relative longevity, very solid performance and stat accumulation won him this spot. Among his more (Hall of) Famous counterparts, there are definitely some achievements of note: After spending his best days in Boston, Ed Macauley ended his career with three year in St. Louis, where he averaged 12- 6; Clyde Lovellette posted a 19- 9, made two All-Star teams and won a ring in his four seasons in St. Louis; Walt Bellamy played for the same four mediocre Hawks teams that Pistol Pete did, averaging 15.6- 12.2; and an aging Moses Malone put up a 16.5- 10 in three solid seasons during the Dominique Wilkins era. As I mentioned, Dikembe Mutombo is likely to join this group in the Hall. After a strong five-year run in Denver, Mutombo spent five seasons (1996-2001) with the Hawks, during which he was an All-Star three times, won a pair of Defensive Player of the Year awards and averaged 11.9 ppg, 12.6 rpg and 3.2 bpg in 343 games. Here’s an additional, absolutely baffling note about Dikembe Mutombo. Did you know that despite winning the NBA’s Defensive Player of the Year award four times, he was only named to the All-Defensive 1st Team on three occasions?